On Friday, November 26th, I was watching the Glenn Beck show on Fox News and was very touched by this story. A woman named Amanda had found a ‘Handmade Coat’ in a Goodwill store. 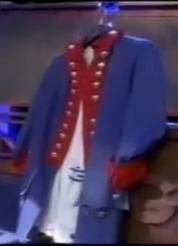 The jacket was a replica of a Revolutionary War coat worn by the Continental Army. Handmade jacket for Bill Beck(Glenn's Father). The jacket was made by Mary Beck(Glenn's Mother) shortly before the Bi-Centennial in 1976. If you are anything like me, I would suggest you go grab a tissue before launching the clip below. It’s a ‘Feel Good’ story that reflects the ‘Golden Rule’. Please take the time to visit Amanda’s little site, and if you can afford to, purchase some items from her. Respectfully submitted by SilenceDogood2010 this Twenty Seventh Day of November in the Year of our Lord, Two Thousand Ten.